"Is God choosing Donald Trump?" This is not a question that many American voters, even those who are supporting the current Republican frontrunner, are asking themselves. 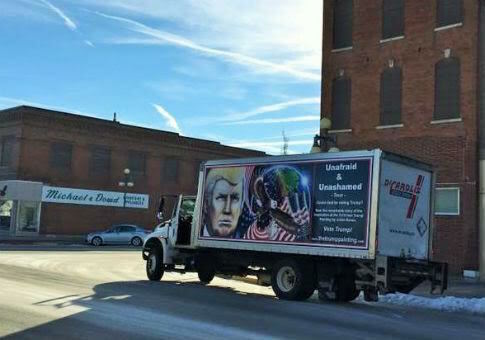 But it is one that Julian Raven, a self-described "evangelist by vocation and artist by trade" who is currently driving through Iowa in a truck with a vinyl reproduction of his massive painting of Trump in tow, is inclined to answer in the affirmative. Raven’s background is not in politics and, until recently, he was not painting either. For years Raven, who was born in London and became an American citizen last fall, made cabinets and other high-end furniture in New York. "I used to think I would have to die first before I made it," he says. 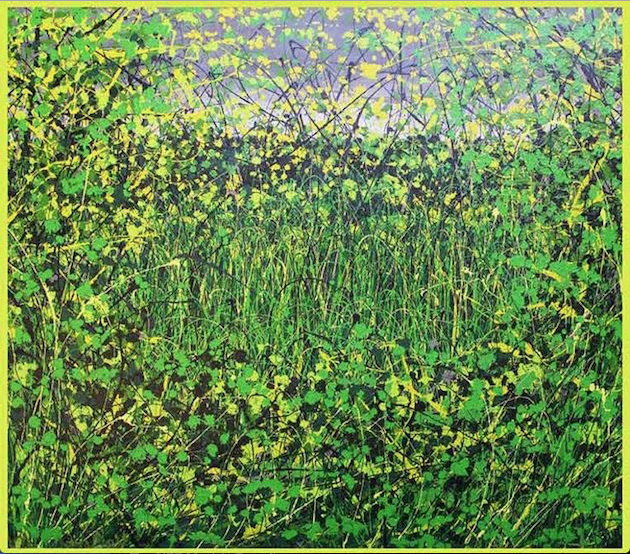 He worked mainly in an abstract expressionist vein under the influence of Jackson Pollock. That changed last year after he saw a photograph of Alan Henning, the British cab driver beheaded by ISIS, and painted his portrait. "He was slaughtered like an animal," Raven says. "I was moved to tears by that level of inhumanity." 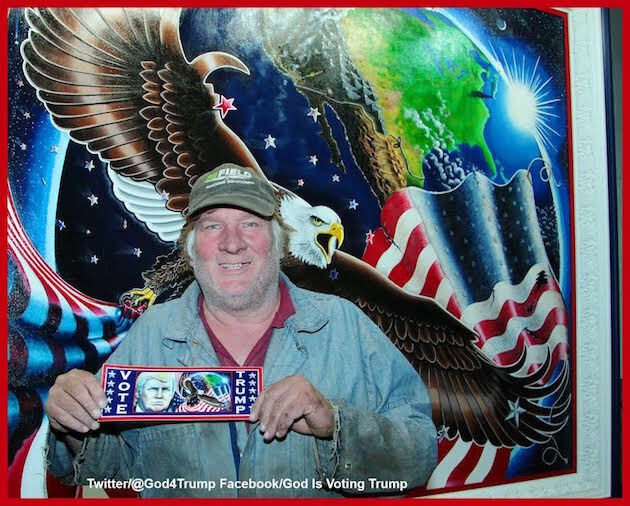 This was the beginning of a turn toward representation in his work that culminated in "Unafraid and Unashamed," the 7’ by 15’ acrylic nightscape of Donald Trump standing beside an eagle and the planet Earth that Raven completed last summer over a period of two months. For Raven, this was a religious experience. "On July 9," he says, "I was looking carefully at a photograph of Mr. Trump’s face and listening to his words when I had this moment of inspiration: the words ‘unashamed and unafraid.’ As I was thinking about him I had this picture in my head immediately of an eagle swooping down and catching a falling U.S. flag." Two weeks later he sat down to work, searching online for reference images of eagles catching fish, when his daughter approached him and asked whether he would give his next painting—of whose details he said she knew nothing at the time—to Trump to hang in the White House when the New York billionaire became president. The next day, during a routine visit to CNN’s website, he stumbled upon a video of his subject standing in his office in Trump Tower with an eagle perched on his arm. Admirer poses with "Unafraid and Unashamed"
"I say this sort of in jest—Mr. Trump is no collector of eagles or eagle aficionado, but I nearly fell off my chair when I saw him there with an eagle," he says. "From that day forward I literally was down in my studio within the hour building this huge fifteen by seven foot structure to stretch the canvas on, and I started painting that day. I did not stop for nearly eight weeks, morning, noon, and night. I could not rest. My wife was, like, ‘Are you okay?’ because I was like a different person. All I did was eat, sleep, and paint— and sleep very few hours. I’ve never experienced anything like it in my life. Most people thought I’d disappeared. I was so consumed." He compares the months he spent finishing the painting to Michelangelo’s work on the Sistine Chapel. "Did you see that movie The Agony and the Ecstasy? It was nothing but pure agony for me. There was no ecstasy at all until the end. I said to my wife, ‘This is remarkable’ because only God could have this perspective, only God could be looking down and see a man and see a country and a nation and the planet and the stars." Raven believes that God has selected Trump to lead the American people. He compares him to Cyrus the Great, the Persian emperor who, after his conquest of Babylon, ordered the rebuilding of the Jewish temple. "God calls Cyrus the ‘anointed’ or mashiaẖ, which is the Hebrew for ‘messiah’ or ‘Christ’ even though he did not acknowledge him," he says. "And the Persians at the time were not even Moslems. They would have been polytheists or idolators." He also suggests St. Paul, Constantine, and Winston Churchill as parallel figures, saying that Trump may have "a great saving experience" in the near future that brings him personally closer to God. According to Raven, there may already be some explicit signs of God’s hand in Trump’s candidacy, something he says that he has been discussing with voters in Iowa. "I was just talking to folks who were saying that every time Trump says something he seems to be right. He’s saying it at the right time. There is an unusual amount of comments he’s made that have been ahead of the curve, like he knew," Raven says. "It’s as if supernaturally God is right with him, that he is speaking things that are so relevant and pertinent to the moment—it’s not just once, it’s happened in a series of events. To me it’s another indicator that God is with him." Raven is unfazed by criticism of Trump’s background, including his past support for abortion, from his fellow evangelical Christians and other social conservatives. "God chooses men very different from the way that men choose men," he says. "What has happened in evangelical circles is that because we ideally want somebody to look like us or be like us or have values, we then assume that God is limited to choosing people like that. As a Christian I know that God writes straight with crooked lines." In fact, Trump’s failure to win over the support of mainstream conservatives and his rise in the polls despite various controversies and perceived gaffes might even be a further sign of his divinely favored status. "Political analysts, all the TV people, all the talking heads, all the pundits, all these people have naysayed him, have been wrong for months, consecutively wrong. And Trump hasn’t been able to do anything to thwart his own campaign. Is it a divine hand that is making it impossible for him not to succeed?" Raven says Trump may not be aware of the degree to which divine involvement is undergirding his success in the polls. He also wishes that his fellow evangelicals showed more interest in discerning God’s will as concerns the 2016 Republican nomination. "The great lack in the church today is the voice saying, ‘No, no, no, this is the man that God is choosing," he says. "We are in critical times. Christians need direction. I look to the people standing there like lost sheep saying ‘I’m voting for my guy.’ We’re the Body of Christ! It’s not my guy or his guy: it’s God’s guy that we should be looking for!" One of the last things Raven tells me about is the meeting held at Trump Tower last fall with pastors, mostly from black Pentecostal churches, during which he stood only a few feet away from his candidate. He was genuinely moved, he said, by Trump’s humility in private, by his willingness to listen. "This was not the man we see fighting out on the street. He’s got a public persona—he does not have great faith in God, so he has to make up for it by his bravado. I think that will change. The scripture says the eye is the lamp of the body. What I witnessed in Mr. Trump’s eyes I cannot put in words. I can only say it was God’s presence." On the ground in the Hawkeye State, where the caucus is now a little more than a week away, Raven says that his painting and his case for Trump’s candidacy have been well received. He has been stopped at local businesses and asked to speak impromptu to the staff, and even offered discounts on hotel stays by admirers. When I asked him his plans are for after the presidential contest, and whether he will continue on to New Hampshire and South Carolina, Raven demurred. For now, he plans to remain in the town of Denison, where he held a meeting on Thursday at a local diner. "Denison," he said, "is a peculiar place in that there is an unusual level of divine favor here." Matthew Walther is associate editor of the Washington Free Beacon. He was previously assistant editor of the American Spectator. His work has also appeared in the Spectator of London, First Things, the Weekly Standard, National Review, the Daily Beast, and other publications. He lives with his wife, Lydia, in Alexandria, Virginia. His Twitter handle is @matthewwalther.